1. Preheat oven to 325�F. Line a 9 x 13-inch pan with foil, leaving a 2-inch overhang on two sides (I spray mine with cooking spray).2. 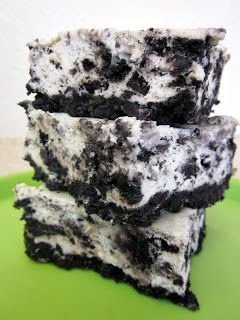 Make the crust: Place 28 Oreos in a food processor and process until finely ground. Pour into a large bowl, add the melted butter, and stir with a flexible spatula until all crumbs are moistened. Place the cookie-crumb mixture in the lined pan and, using your fingers, press the mixture firmly and evenly into the bottom. Bake 10 minutes, then remove to a wire cooling rack (leave the oven on) while you make the filling. Snap the remaining Oreos in half, put them in the food processor, and turn on and off quickly a few times, just until the cookies are roughly chopped.